Thalli parasitic on Centroceras; visible when mature as colourless pustules up to 500 µm in diameter, usually just above nodal rings on host axes. Mature thalli roughly hemispherical, cushion-like, comprising repeatedly-branching rows of cells radiating from a central cell that is attached to the host. Base of central cell penetrating cortex of host and attaching to axial cell of host. Reproductive structures arising in outer layers of pustule. Tetrasporangia cruciately divided, prolifically scattered over surface. Sexual pustules monoecious or dioecious; spermatangia covering surface or mixed in patches with cystocarps. Cystocarps roughly hemispherical, with numerous trichogynes when young, scattered over surface of pustule. For a detailed description and illustrations see Pocock (1956). Pocock recorded this species from localities between Port Elizabeth and Isipingo, south of Durban (36-51). It is an obligate parasite on Centroceras, but not common, and generally found on older (short, stunted) specimens of the host (Pocock 1956: “when found on a single tuft of the host usually present in fair numbers...”). World distribution: Otherwise recorded only from the type locality in Western Australia. Type locality: Dirk Hartog Island, Western Australia (Pocock 1956). Note: In her detailed study of this species, Pocock (1956) expressed some doubt that it belongs to the Ceramiales and discusses its possible affinities with other red algal orders. Episporium centroceratis. 1 Young pustule with numerous trichogynes in various stages of development. Note narrow band of spermatangia low on the cushion. 2 Mature pustule with developing cystocarps, trichogynes and spermatangial areas. 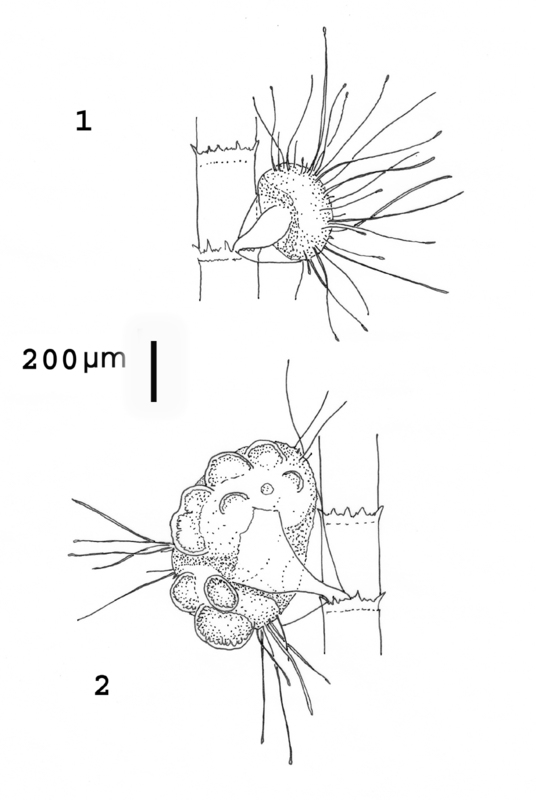 Re-drawn from Pocock 1956, Fig 2 e and f). Episporium centroceratis. 1 Part of section of pustule showing developing tetrasporangia and two empty sporangial walls. 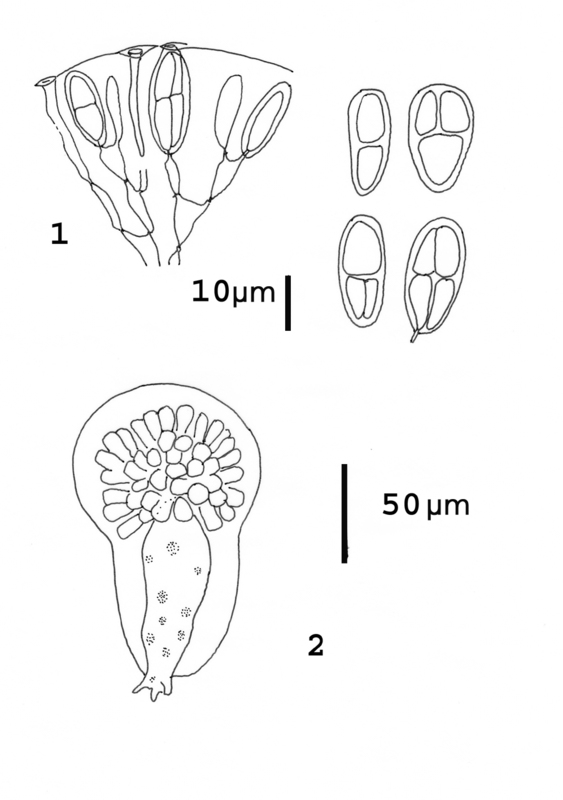 Tetrasporangia illustrated on right. 2 Developing pustule showing attachment organ at base, and numerous nuclei in central cell. Re-drawn from Pocock 1956, Figure 2 a and b and Figure 1n. Möbius, M. 1885. Ueber eine neue epiphytische Floridee. Berichte der deutsche botanischen Gesellschaft 3: 77-80, Plate VII.